Jerry Pournelle at NASFiC in 2005. Public domain photo by G.E. Rule. If you follow science fiction news, you likely have heard by now about the death of Jerry Pournelle, who died Sept. 8, age 84. 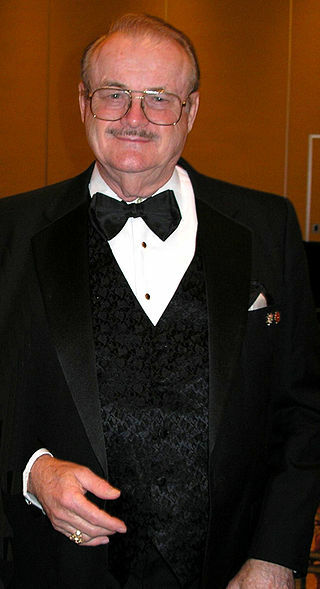 Pournelle was arguably best known for his collaborations with Larry Niven, which earned Hugo nominations for The Mote in God’s Eye, Inferno, Lucifer’s Hammer and Footfall. 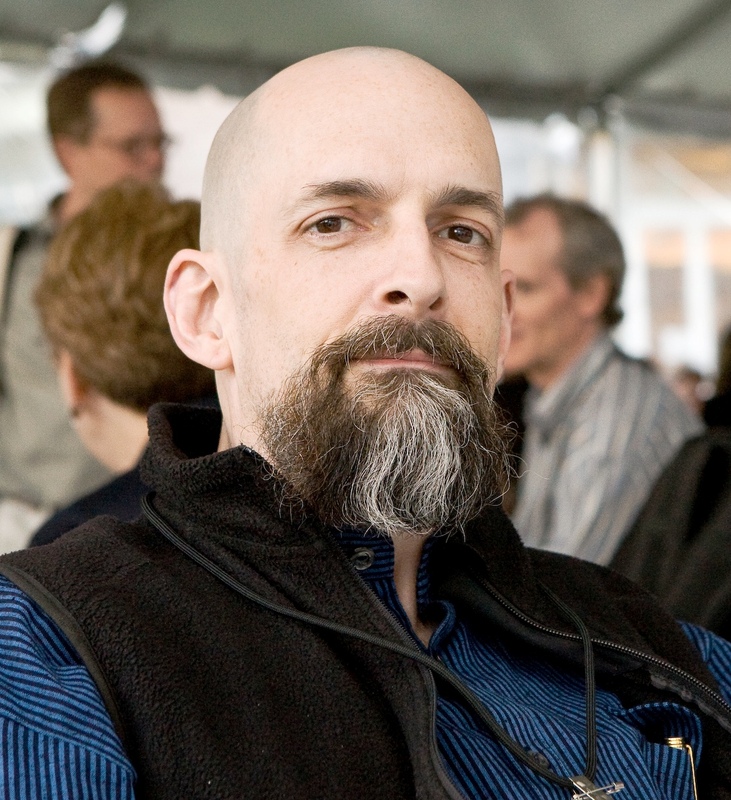 He won the Prometheus Award in 1992 for Fallen Angels, a collaboration with Larry Niven and Michael Flynn, and the Prometheus Hall of Fame Award in 2001 for The Survival of Freedom, an anthology he co-edited with John F. Carr. There is also a useful Wikipedia entry. See also the Science Fiction Encylopedia article. The Libertarian Futurist Society has chosen The Core of the Sun, by Johanna Sinisalo, as the 2017 winner in the Best Novel category of the 37th annual Prometheus Awards. LFS members also voted to induct Robert Heinlein’s story “Coventry” (first published in 1940 in Astounding Science Fiction) into the Prometheus Hall of Fame for best classic fiction. In a separate awards process, the LFS also recently selected the first chapter of Freefall, a Webcomic by Mark Stanley, to receive a Special Prometheus Award in 2017. The 2017 awards will be presented at 2 p.m. Friday Aug. 11 in Room 205 of Messukeskus, the Helsinki Exhibition and Convention Centre during the 75th annual World Science Fiction Convention Aug. 9-13, 2017 in Helsinki, Finland. Sinisalo will receive a plaque and a one-ounce gold coin; other winners receive plaques and smaller gold coins. The 2016 novel, translated by Lola Rogers and published by Grove Press/Black Cat, is both libertarian and feminist. In it, the well-known Finnish writer imagines a dystopian eugenics-dominated alternate history of Finland. While coping with strong feelings about her lost sister, the heroine battles an oppressive, manipulative and male-dominated regime that makes women subservient housewives and mothers and bans alcohol, mind-altering drugs, caffeine and hot peppers. The other Best Novel nominees were Morning Star: Book III of The Red Rising Trilogy by Pierce Brown (Del Rey); Speculator by Doug Casey and John Hunt (HighGround Books); Dark Age by Felix Hartmann (Hartmann Publishing); Kill Process by William Hertling (Liquididea Press); Through Fire by Sarah Hoyt (Baen Books); Too Like the Lightning by Ada Palmer (TOR Books); Written in Fire by Marcus Sakey (Thomas & Mercer); Arkwright by Allen Steele (TOR Books); On to the Asteroid by Travis S. Taylor and Les Johnson (Baen Books); Necessity by Jo Walton (TOR Books); and Angeleyes by Michael Z. Williamson (Baen Books). Other Hall of Fame finalists were Poul Anderson’s 1967 story “Starfog,” Rudyard Kipling’s 1912 story “As Easy as A.B.C.,” Vernor Vinge’s 1968 story “Conquest by Default,” Kurt Vonnegut’s 1971 story “Harrison Bergeron” and Jack Williamson’s 1947 story “With Folded Hands . . .”. For more than three decades, the Prometheus Awards have recognized outstanding works of science fiction and fantasy that dramatize the perennial conflict between Liberty and Power, expose the abuses and excesses of coercive government, contrast the virtues of cooperation with the evils of coercion, critique or satirize authoritarian ideas, or champion individual rights and freedoms as the mutually respectful foundation for civilization, peace, prosperity, progress and justice.